Electronics Costs > How Much Does a Fingerprint Scanner Cost? How Much Does a Fingerprint Scanner Cost? Fingerprint scanners have developed a lot over the years. What used to be an expensive item that only major corporations owned has now become a common household item. Fingerprint scanners can be found in local police stations, hospitals, and even your local retail store’s backroom. Instead of using a keycode or a password, a user will simply place their finger on the device and it will either deny or allow access. The cost of a fingerprint scanner will depend on the brand, the complexity of the scanner, condition and where it’s purchased from. On average, a fingerprint scanner can cost anywhere from $40 to as much as $400+. Most scanners designed for household use, however, were in the $40 to $100 range. For example, the highly-rated Eikon Digital Privacy Manager can retail for $75 to $90. This particular device is compatible with any Windows machine and can provide a quick and reliable biometric authentication. A USB fingerprint scanner that plugs directly into a USB port of a desktop computer/laptop can retail from $19 to as much as $100. A computer fingerprint scanner that is normally connected to a computer keyboard or an additional add-on device can retail for $25 to as much as $115. For instance, the Microsoft Fingerprint Reader retails for $69 to $99. A doorknob that has a fingerprint scanner built directly into it can range anywhere from $118 to as much $300 depending upon the material used and their compatibility. It’s also not unheard of cities paying more than $2,000 for a complex fingerprint system. This PoliceOne.com article talked about the state of Georgia spending close to $2,000 to $2,800 for its rapid ID scanners. A fingerprint scanner kit will come with the installation materials, which usually include a CD-ROM/file download and a guide on how to use the scanner. Many popular brands will back their product with a limited warranty that can last upwards of a few years. A fingerprint scanner is going to allow you to bypass passwords. 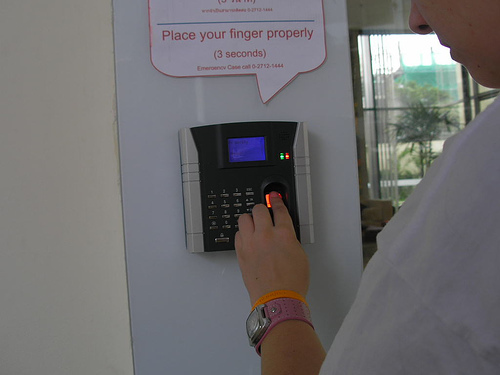 Instead of using a keyboard or a keypad to enter a password, a finger will only have to be placed on an area. With the touch of a finger, the device can open doors, open up software packages on the computer, and so much more. These scanners can often come installed on a laptop. If you choose this route, a laptop can cost a lot more. Plan on spending anywhere from $200 to as much as $500 more if it does go bad. Many opt to purchase two scanners in case they ever need a backup. It is wise to program a backup just in case the first one fails. If you do not want to purchase a backup, consider looking for a kit that will allow you to backup the information directly on your computer. Fingerprint software, if you want to use a third-party option, can be an additional cost to consider. Some kits are poorly made. Do not settle for purchasing one that is cheap because they can easily be hacked. It is best to research the reviews online to ensure that you are purchasing a kit that is highly rated. If your company is high security, the extra money spent will be well worth it. Fingerprint scanners are great for identifying a person’s identity, and while many companies use badges that are coded and have pictures, these can be hacked if you have the correct equipment. A person’s fingerprint, however, cannot be duplicated. But again, this doesn’t mean a fingerprint scanner can be hacked. Pocketnow.com talked about a group of hackers who were successfully able to hack the iPhone’s fingerprint system. Consider purchasing a kit either used or even an older model that is still new. If purchasing used, just make sure that the settings are always reset to default so that all the old information was destroyed. eBay often has older units for less than $15.